This 2-1/2 Gallon Paint Tank features a Teflon-coated steel tank for easy clean up, casters for stability, double output regulator, ON/OFF ball valve, pressure relief valve and built-in paint mixer. Large lid gasket and clamps stay attached during lid removal. 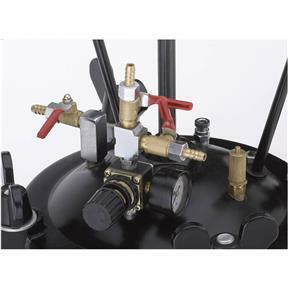 Works with any pressure feed HVLP or conventional spray gun. Maximum pressure is 45 PSI. Hose not included. Material: Medium to high solids (stains, primers, multi-component paints, clear coats, acrylics, epoxies). Not compatible with water-based materials. Bought this pressure tank for resin casting. After I modified it for my needs it works perfectly! 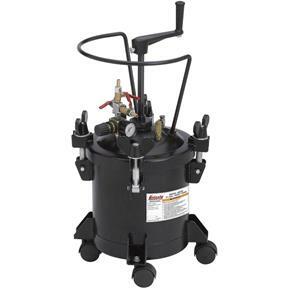 If you are doing resin casting, spend the extra money on this model and dont go the cheap route with the harbor freight pot. This one is infinitely safer! Converted to a pressure pot for resin blanks. Works well. I converted my Grizzly to a pressure casting pot shortly after receiving it. You can easily do so by simple removing the stirring rod and replacing with a 5/8" bolt. The paint siphon tube takes a little work to remove but it will unscrew with some persuasion or if you're never going to use this for paint you could always use a pipe cutter to cut it short. Holds pressure well and the release valve on mine seems accurate at 50 psi. The lid on this is far superior to some of the other "beginner" pressure pots I've seen folks purchase. I bought this about two months ago. Great product. It works as indicated. easy to set up. I plan to purchase another in the future.